Sonus Faber Guarneri Evolution. 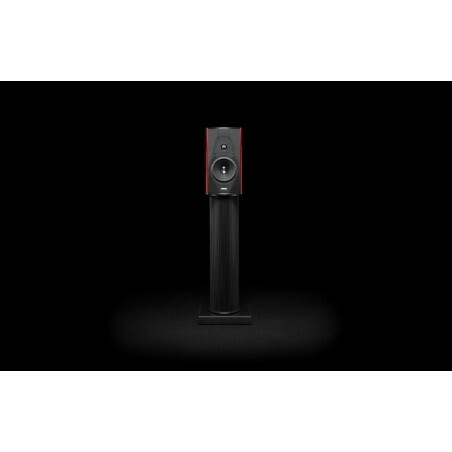 Compact 2-way bass reflex monitor / 2 speakers. The Sonus faber Guarneri evolution is a distinguished speaker that takes advantage of the refinements incorporated by the prestigious firm of Arcugnano in its formidable model of absolute reference "The Sonus faber" to reach the highest levels of sound excellence from a design of Two-way mounted in an enclosure of very moderate dimensions. With an external structure that adopts the already classic design in the form of lute of Sonus faber constructed with multilayer panels arranged in antiresonant configuration, the last version of the legendary Guarneri incorporates as fundamental fundamental a structure of metallic fixation that fastens the panels superior and inferior of the Enclosure accompanied by an absorption scheme based on mass control that suppresses the individual resonances of the wooden structure. Regarding the configuration used, the Guarneri evolution stands out by including an optimized suspension with a very low spurious vibration level and a para-aperiodic loading system with an exclusive stealth reflex port that guarantees minimal interaction between speakers - In turn selected from the world elite and made to measure following precise instructions of Sonus faber- and enclosure. Compact 2-way bass reflex monitor / 2 speakers. Lute-shaped enclosure built with multi-layer wood panels in anti-resonant configuration. Internal metallic fixing structure derived from "The Sonus faber" model. Progressive slope frequency divider filter and optimized phase and amplitude response executed with the best components available on the market. Transducers made to measure for Sonus faber. Frequency response of 40-30,000 Hz. Sensitivity of 86 dB / W / m.
Nominal impedance of 4 ohms. Power of the associated amplifier between 25 and 200 watts continuous. Dimensions: 320x795x423 mm (W x H x D).